As a member of Generation X – Americans born between 1961 and 1981 – I’ve grown up with warnings that Medicare and Social Security won’t be there for us. Sadly those warnings appear to be all too true as I enter middle age. Take a look at the bar chart from the General Accounting Office. 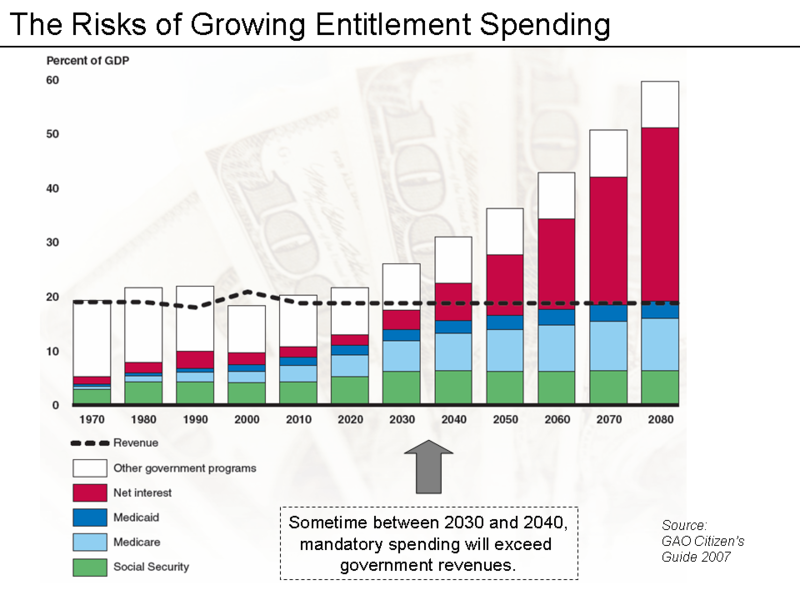 It shows how the cost of entitlements will exceed revenues sometime between 2030 and 2040, which is precisely when I will be retiring. Traditionally we think of 65 as retirement age – that’s 2031 for me. But under current law I won’t qualify for full social security benefits until I’m 67 years old in 2033. And I’ll bet they’ll jack that up even more over the next two decades. Compounding the worry is that my Oklahoma Teacher Retirement is also fiscally unsound. The state’s pension system is woefully underfunded – its assets won’t even cover half of its liabilities. And the trends are poor – in the past decade the ratio of active members to annuitants has fallen from 2.5 to 1.9. And as of 2009 the number of years before the system would become fully funded rose from over 50 years to…wait for it…infinity. That’s from the 2009 Actuarial Report on the system’s website, directly acknowledging that under existing legislation the system will never have enough funds to cover its liabilities. We know these projections are unreliable – legislation will change things over the coming decades. But it is inevitable that those changes will be to my generation’s detriment. The nation will have no choice but to cut our benefits to avoid bankruptcy. It appears likely that while for years I’ve witnessed older generations receiving far more in Social Security benefits than they ever paid into the system, Gen Xers like me could receive less than we put in over our careers. And given the disturbing political climate in Oklahoma, I wouldn’t be surprised to see the Teacher Retirement System eventually changed from defined benefits to defined contributions. That means while generations of teachers before me retired with guaranteed levels of income, I might be ending my career with only a state-managed investment fund – one which could be catastrophically reduced by a market downturn. And given the fiscal crises we’ll face in the 2030s I reckon the market will be down…if not in freefall. I can’t control the Ponzi schemes our federal and state governments have set up. And as a bachelor I have no offspring to care for me in my old age if I don’t plan for the worst. So I’d better pay close attention to the received wisdom that one should put aside ten to twenty percent of salary for retirement. For some time, via automatic paycheck deductions and generous parents, I’ve been able to keep my IRA and 403(b) contributions (the latter is the public-sector version of a 401(k) but of course the school doesn’t provide any sort of employer match!) up at the high end of that range. But, given the ticking timebombs in the federal and state retirement systems, perhaps I need to set aside even more. Doing that and still saving enough money for the car and home will be a challenge given how I dislike cooking yet love consumer electronics. Looks like my summer vacations need to involve driving to a campsite or budget motel, not flying out to the coast. Thankfully my favorite leisure activity of day hikes can be done on the cheap! This entry was posted in politics, random. Bookmark the permalink.